Because of Camp I… have learned to face my fears. Before my days as Co-Director, I was a camper for two years, and a counselor for four. I’ve tried dozens of new things, learned even more, and know first-hand how special every level of life at Quinebarge is. Even as Director, I’ve been on the receiving end of encouragement and coaching from our fantastic counselors. During my very first week of camp, I signed up for climbing wall. I’d never tried one before, but as I watched a CIT scamper up as quickly as his belayer could tighten the rope, I thought it must be a piece of cake. When my turn to climb arrived I grabbed a handhold, put my feet up, and began to climb. About 20 feet up, I couldn’t quite reach the next grip, and I looked down for instructions from my counselor – who seemed to me to be hundreds of feet below me. I immediately became nervous, despite encouragement and assurances of my safety, after a few minutes I wanted to come down. Instead of pushing a scared camper too far, he lowered me, assuring me that being afraid is totally normal, and that I wouldn’t have to try again until I felt ready. Fast forward to 2014: I was taking photos during High Ropes when a counselor jokingly asked me if I was going up. I told her I was afraid of heights, and she said that some campers are scared too-and that’s ok-but when they try it, they have fun. So, after a bit more encouragement, I went thirty feet up, into the trees. 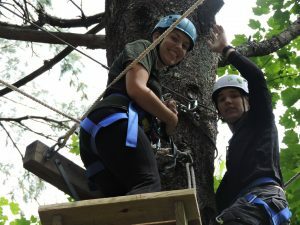 With coaching from counselors Lexi and Joe, as well as a handful of campers, I made it through the entire course and down the zipline – and it was fun! Once I got to the ground, I was rewarded with high-fives, and a sense of accomplishment that I had faced my biggest fear. Since then, I’ve tried local ropes courses, and was even able to join my friends ziplining in a cloud forest! Whether you’re a camper, counselor, or other staff member, being a part of the Quinebarge family is an amazing experience, that helps you learn, grow, and achieve new heights. I am and forever will be grateful for Camp Q. I hope I’ll see you there next summer!